The 1922 Stanley Cup Final was contested by the National Hockey League (NHL) champion Toronto St. Pats and the Pacific Coast Hockey Association (PCHA) champion Vancouver Millionaires. The St. Pats defeated Vancouver three games to two in the best-of-five game series to win their only Stanley Cup as the St. Pats. All games were held at Arena Gardens in Toronto. A fifth and deciding game five was necessary in this series to determine who would win the Cup. After Vancouver won game one, 4–3, Babe Dye scored 4:50 into overtime of game two to give Toronto a 2–1 win. Then in game three, goaltender Hugh Lehman led the Millionaires to a 3–0 shutout win. However, the St. Patricks tied the series in game four, 6–0, as John Ross Roach became the first rookie goaltender to record a Stanley Cup shutout. game five belonged to Toronto as Dye scored 4 goals in a 5–1 victory to clinch the Cup. For the series, Dye scored 9 out of the St. Pats 16 goals, while Roach posted a 1.80 goals-against average. 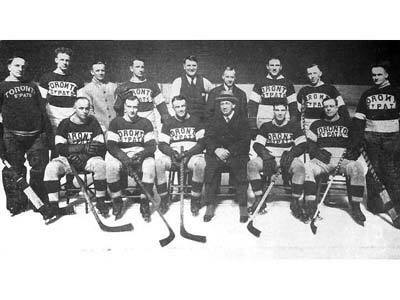 The Western Canada Hockey League began with the 1921-22 season, and the playoff structure was altered as a result. The winners of the two Western leagues would meet to decide a winner, with the victor heading east to face the NHL champion in a best of five series. The Vancouver Millionaires defeated the Regina Capitals to earn the right to face the Toronto St. Pats. The series took all five games, but the city of Toronto would win its second Stanley Cup. Toronto goaltender John Ross Roach recorded the first Stanley Cup shutout by a rookie, and posted an excellent 1.80 goals-against average. Babe Dye of the St. Pats notched nine of the club's 16 goals. The 1921–22 Toronto St. Patricks season was the fifth season of the Toronto NHL franchise, third as the St. Patricks. The St. Patricks would win the NHL championship and the Stanley Cup. The St. Pats would play consistent hockey all season long, finishing the season with a 13–10–1, earning 27 points, and finishing in second place in the league, behind the Senators, and once again earn a spot in the O'Brien Trophy finals. Babe Dye led the St. Pats with 30 goals, two less than league leader Punch Broadbent of the Ottawa Senators, and his 37 points was the third highest in the NHL, behind Broadbent and Senators teammate Cy Denneny. Harry Cameron scored 19 goals and 27 points from the blueline, while Corbett Denneny also scored 19 goals and earned 26 points in total. Reg Noble had another solid season, scoring 17 goals and 25 points, while Ken Randall also got into double digits with goals, scoring 10. Denneny led the club with 28 penalty minutes, with Randall just behind him, getting 20 penalty minutes. In goal, John Ross Roach had a solid rookie season, playing in 22 games, finishing with a record of 11–10–1, and a GAA of 4.07. The St. Pats would face the Ottawa Senators in the two game, total goal O'Brien Cup finals. Ottawa upset Toronto the previous year, however this season, Toronto was the underdog, as they finished 3 points behind the Senators in the NHL standings. The St. Pats defeated the Senators in the first game held at Mutual Street Arena by a score of 5–4. The series moved to Dey's Arena in Ottawa for the second game, and the St. Pats used the strategy of icing the puck whenever possible in this game to keep their lead, and it worked, as the teams played to a 0–0 tie, as Toronto advanced to the Stanley Cup finals, winning the series 5–4. Toronto would face the Vancouver Millionaires of the PCHA to determine the winner of the 1922 Stanley Cup Finals in a best of 5 series, with all games being played at Mutual Street Arena. Vancouver took a 1–0 series lead, defeating Toronto 4–3, however, Babe Dye scored in overtime in the second game, evening the series to one win a piece. Vancouver took a 2–1 series lead, defeating the St. Pats 3–0 in the third game. The Millionaires looked to end the series in the fourth game, however, John Ross Roach shutout Vancouver 6–0, setting up a Stanley Cup deciding fifth game. The St. Pats, led by Babe Dye and his four goals, easily defeated Vancouver 5–1, as the Toronto franchise won the Stanley Cup for the second time in team history.